Age-related macular degeneration (AMD) is a leading cause of vision loss. This condition may cause permanent loss of your central vision. It usually does not affect your side, or peripheral,vision. AMD affects your ability to see near and far and make some activities, like threading a needle or reading, difficult or impossible. However, it almost never causes total blindness. The retina can be divided into two areas: the macula and the peripheral retina. The macula is a small area in the center of the retina near the optic nerve. This is the part of the retina that allows you to see fine details clearly. Macular degeneration is a deterioration or breakdown of the macula. When the macula does not function properly, your central vision may be affected by blurriness, dark areas or distortion. Colours do not look the same for each eye. Most people who have AMD have the dry, or atrophic, form. This condition is caused by ageing and thinning of the tissues of the macula (called atrophy). Macular degeneration usually begins with the appearance of drusen under the retina. When drusen are present for an extended period of time, the macula may become thin and stop working properly. Vision loss in the dry form of AMD is usually gradual. People who develop dry AMD must carefully monitor their central vision. Any changes in your vision should be reported to your Ophthalmologist, as this form can change into the more damaging wet (exudative) form of AMD. The wet, or exudative, form of macular degeneration occurs in about 10 percent of all macular degeneration cases, but it can cause more damage to your central or detail vision than the dry form. Wet AMD occurs when abnormal blood vessels begin to grow underneath the retina. 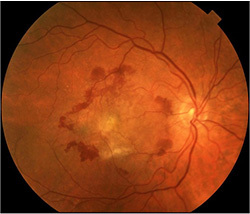 The abnormal blood vessel growth is called chorodial neovascularisation (CNV) because these vessels grow from the layer under the retina called the choroid. These new blood vessels may leak fluid or blood, blurring or distorting central vision. Vision loss from this form of AMD may be faster and more noticeable than that from dry AMD. The longer these abnormal vessels leak or grow, the more detail vision will be lost. Also, if abnormal blood vessel growth is present in one eye, there is a risk that it will occur in the other eye. The earlier that wet AMD is diagnosed, the better chance you have of preserving some or much of your central or detail vision. 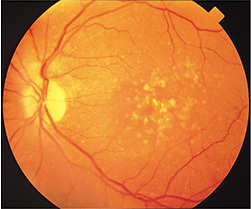 If your Ophthalmologist finds an abnormality and suspects the wet form of AMD, he or she may take special photographs of the eye called fluorescein angiography. These photographs determine if abnormal blood vessels are under the retina. How is AMD Monitored and Treated? Unfortunately, at this time there is no single proven treatment for the dry form of AMD. However, a scientific study has shown that antioxidant vitamins and zinc may reduce the impact of AMD in some people by slowing its progression toward more advanced stages. If you have been diagnosed with dry AMD, you should use a chart called the Amsler grid to monitor your vision. If you detect any changes when looking at the grid, you should notify your Ophthalmologist immediately. Treating the wet form of AMD may involve the use of laser, or anti-VEGF injections, e.g. lucentis, avastin or eyelea. Treatment of wet AMD generally reduces the risk of severe vision loss, but it does not eliminate this risk. There is compeling scientific evidence that three antioxidant vitamins and the mineral zinc reduce the impact of AMD in some people with moderate and advanced stages of the disease. Vitamin C, vitamin E and beta carotene, along with zinc. Vision rehabilitation can help people with AMD compensate for vision loss. People with low vision can learn new strategies to accomplish daily activities. These skills, including mastering new techniques and devices, help people with advanced AMD regain their confidence and live independently despite loss of central vision. There are many devices specifically designed to help people with low vision function better. Different devices are available for different tasks. A trained professional can help you understand which device is best for accomplishing your particular needs. Training and practice are also important in order to become skilled at using any device. Optical low-vision devices use lenses to magnify objects, making them easier to see. The lens strength will depend on your vision and the size of the object or print to be seen. Magnifying Spectacles are stronger than ordinary glasses. They can be used for near tasks such as reading, threading a needle, or any activity that requires detailed vision. The printed page or object must be held closer than usual in order to keep things in focus. One advantage of magnifying spectacles is that your hands remain free to hold reading materials or perform tasks. Hand Magnifiers are familiar to most people and are available in varying strengths. Reading material is not necessarily held as close to the face as with magnifying spectacles, and some models come with a built-in light. High powered magnifiers are often available only in specialised stores or through vision rehabilitation professionals. Stand Magnifiers rest directly on the reading material, keeping the lens at the proper distance from the page. The ability to rest the magnifier on the page is useful for patients with a tremor or arthritis. Telescopes are used for seeing objects or reading signs that are far away. They can be handheld like a pair of regular binoculars, or mounted on a pair of glasses. Video Magnifiers are electronic devices that use a camera and television screen to enlarge printed material, pictures or small objects. The are adjustable and can enhance the material in different ways – for example, by making the print appear darker (increase contrast). The technology is developing rapidly, and electronic devices are becoming smaller, more portable and easier to use. Some can even be used for both distance and near tasks.